ION VR will try to close the gap between quality VR headsets without Hardware (like Noon VR, Homido VR and Zeiss VR One) and Samsung's Gear VR which has a built-in Gyroscope to reduce latency. Using MotionSync technology, the ION VR promises to deliver a better experience reducing motion blur and creating a very clear and comfortable view. This is great news for iPhone users. Gear VR is unfortunately not compatible with Apple products so , at the moment, there is no high-end VR headset with integrated hardware to improve the Virtual Reality on iPhones. The overall specifications are good. 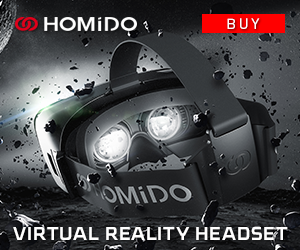 It's weight is 340 grams, which is 90 grams more than the Homido VR and but 60 grams lighter than the VRizzmo. Adjustable IPD and a 100 degree Field of View. The ION VR wil support smartphones with screen sizes going from 4.5 inch until 6 inch. This means it will support the iPhone 6, 6plus, 6s and 6s plus. Like the Gear VR, the ION VR has Built-in technology to improve your immersive experience. ION VR seems to be very secretive and is not telling us very much about the integrated hardware but in an interview with UploadVR.com they reveled that “removes the distortion rendering from the mobile device and moves it into the headset” and “the system is a combination of optics and on-board processing.”. They also said that it has at least an accelerometer and that it would save the battery life of your phone during usage. The hardware is modular to make it possible to upgrade in the future. This is very important because there is nothing evolving faster than the VR tech. about exactly what matters for the full experience, and making it empowering, habitable and enjoyable too in fact make usee of.